+Cisco unveiled its flagship Network Convergence System (NCS) core routing fabric designed to bring scalability, open programmability, and IP/Optical integration to power the Internet of Everything. unprecedented levels of performance, functionality, programmability and scale for a network processor. 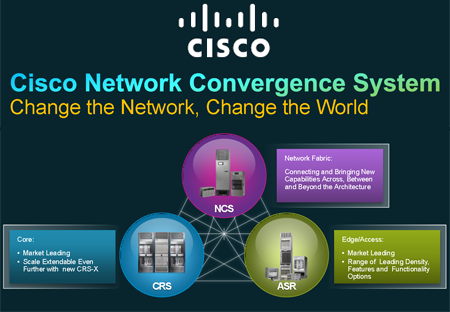 Intelligent Convergence for Optimization and Simplification: The Cisco NCS converges IP and optical networks and is designed to seamlessly integrate with the Cisco Unified Computing System (Cisco UCS) and the Dynamic Fabric Automation capabilities supported by Cisco's data center innovations. 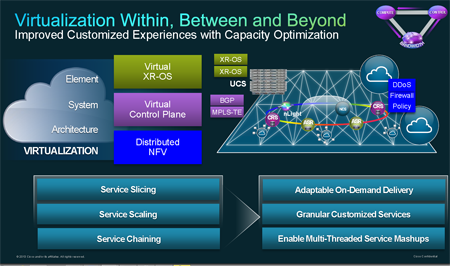 This convergence capability enables the NCS to act as a flexible foundational network fabric for an evolved programmable network, able to shift and redirect data center, core, edge and optical resources spontaneously and in real time, allowing service providers to accelerate service velocity while reducing overall complexity and operating costs. 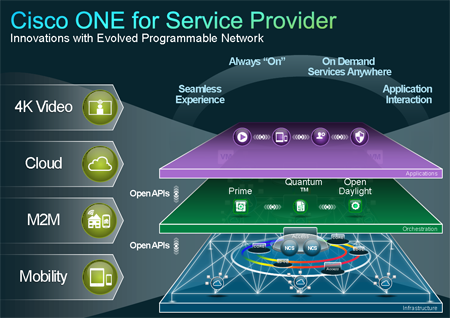 Advanced Virtualization Capabilities: The NCS's element, system and architectural virtualization capabilities converge to enable the system to orchestrate services and resources across disparate physical, virtual and geographical elements as if they are part of a single unified system using Cisco Prime and Cisco Quantum solutions. The system's advanced virtualization features enable service providers to elastically scale up and down both network and compute resources, utilizing scalable multichassis configurations that can be managed as a single entity. 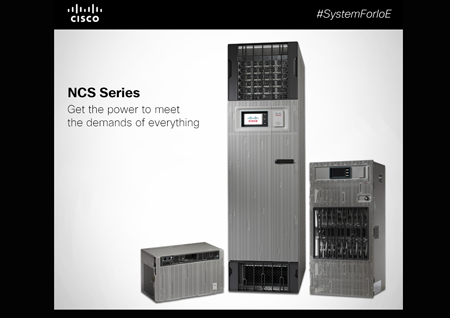 If system scale is exceeded in one part of the network, the NCS moves control plane functions onto UCS servers in the data center, creating virtually unlimited control plane scale by capitalizing on the blade servers' processing. NCS 6000 -- the flagship router boasts the ability to transport up to 5 Tbps per slot and 1.2 Pbps per system. 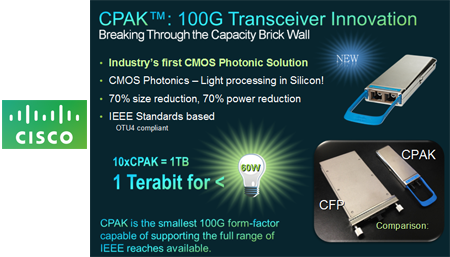 By using its 100 Gbps,CMOS-based CPAK transceivers Cisco is delivering the first 1 Tbps line card. Each line card runs up to 1 Tbps throughput, using a mix of 10, 40, or 100 Gbps interfaces per card. Significantly, the NCS 6000 will run virtualized IOS-XR instances while supporting hardware-enabled true zero-packet, zero-topology loss (ZPL/ZTL) In Service Software Upgrade (ISSU). This will enable lossless software image updates. Thanks to the CMOS silicon photonics and new network processor, Cisco said the NCS 6000 will achieve the lowest carbon footprint in service provider routing . The NCS 6000 is currently shipping. NCS 4000 -- bridges the gap between the IP and optical layers with time division multiplexing (TDM), packet switching, and integrated DWDM functionality. It will support 400 Gbps per slot and 6.4 Terabits per system and be available in single, back-to-back, and multi-chassis configurations. It will offer full optical channel data unit (ODU-0) level switching, with ports supporting SONET/SDH, Ethernet, and channelized OTN Full IP, MPLS, MPLS-Transport Profile (TP), and Carrier Ethernet switching, supporting 10 Gb, 40 Gb, and 100 Gb Ethernet interfaces with the option of OTN encapsulation. The NCS 4000 will be available in the first half of 2014. NCS 2000 -- a DWDM transport platform that evolves the Cisco ROADM portfolio by introducing 96-channel nLight ROADM technology. It offers touchless re-configurability through colorless, omni-directional, and contention-less add/drop, networks. The NCS 2000 introduces hybrid Raman-EDFA amplifiers known as erbium doped Raman amplifiers (EDRA). The NCS 2000 is currently shipping. The three platforms are designed to work as a single, integrated system. "The Cisco NCS was engineered with the programmability, intelligence and scalability to meet the demands of today and tomorrow. The NCS delivers an evolved programmable network that will enable service providers to generate new revenue streams and business models, while delivering exciting new experiences to their customers," stated Surya Panditi, SVP and GM, Cisco's Service Provider Networking Group. Cisco named three early adopters for NCS: BSkyB (Sky), KDDI and Telstra. 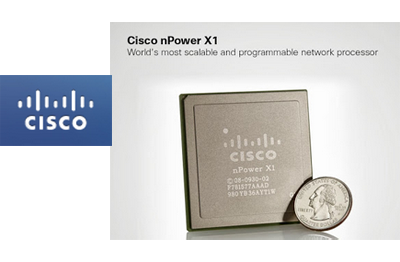 Earlier this month, +Cisco unveiled its nPower X1 integrated network processor -- the first generation of a new line of custom-developed silicon designed for programmatically handling high volumes of transactions at high data rates. In March 2013, Cisco introduced its 100 Gbps, CMOS-based transceiver technology -- describing it as a breakthrough for the rollout of 100G services. The Cisco "CPAK" transceiver reduces space and power requirements by over 70 percent compared with alternative transceiver form factors, such as CFP. Future routing and switching line cards will also incorporate CPAK technology. One year after the launch of its Project VIP network upgrade program, the network is hitting "best-in-class" performance levels for reliability, speed and wireless network coverage, said Randall Stephenson, +AT&T 's Chairman, CEO and President, speaking at the Goldman Sachs Communacopia Conference. The consumer fixed line business is growing steadily at 2-3% and will soon hit 10 million broadband IP subscribers. U-verse is now a $1 billion per month revenue stream and it's growing nearly 30% year-over-year. Small business IP broadband is also growing well. In NYC, more that half of mobile traffic is already on the LTE network. AT&T is seeing great sales growth for tablets. Strategic business services is now an $8 billion per year revenue stream. Digital Life, which is automating the home and providing security services, has seen the use of video cameras to be the No.1 attachment. The Connected Car is a key area of interest and relationships are being signed by the major manufacturers. AT&T is close to signing a deal for the sale of tower assets. The deal could include about 10,000 towers out of about 70,000 towers in its portfolio. The sale is an opportunity to monetize some assets, much like selling the company's administrative real estate. AT&T will continue to Cricket brand for pre-paid mobile service. AT&T's pension plans are close to being fully funded. The video opportunity is significant. Over 50% of traffic on the IP network is now video. OTT is a key player for AT&T too. AT&T's network focus is now about delivering video. AT&T is preparing to launch an LTE-Broadcast service that will use 700 MHz licenses that were acquired from Qualcomm. No timeline was provided. In 2012, AT&T acquired 11 of Qualcomm’s D and E Block licenses in the Lower 700 MHz band for $1.9 billion. Qualcomm originally planned to use this spectrum for its Media FLO mobile TV service, which was launched in 2009 and then cancelled in early 2011 after failing to catch on in the market. 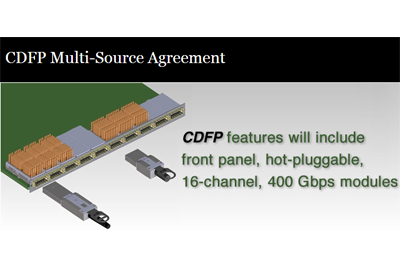 A new consortium has been formed to define specifications and promote the adoption of interoperable 400 Gbps hot pluggable modules. Founding members of the CDFP MSA include: Avago Technologies, Brocade, IBM, JDSU, Juniper Networks, Molex Incorporated and TE Connectivity. The companies said the project scope will be to specify electrical interfaces, mechanical interfaces, and software interfaces, which may include optical connector and mating fiber optic cable plug, electrical connector, guide rail, front panel and host PCB layout requirements. Additionally, the CDFP MSA specification is expected to include thermal, electromagnetic and electrostatic discharge design recommendations, all significant factors when creating standards. +IBM and +Deutsche Telekom AG announced a collaboration to provide the IBM MobileFirst platform in the cloud to small and medium sized (SMB) customers in Europe. 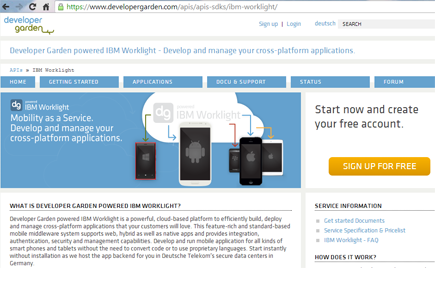 Deutsche Telekom's developer platform - Developer Garden - has launched the new cloud service, Developer Garden powered IBM Worklight, which allows developers to cost-effectively and quickly create apps for all mobile platforms and bring them to market faster. The new service provides developers with access to Deutsche Telekom's Application Programming Interfaces (APIs) and communication services and expertise. Developer Garden users will be able to quickly access IBM Worklight capabilities to develop, run and manage HTML5, hybrid and native apps that combine Deutsche Telekom's communication features such as speech-driven Interactive Voice Response (IVR), voice mashups and Short Message Service (SMS). A retailer can increase customer retention by integrating geo-location capabilities from IBM Worklight and Deutsche Telekom's SMS API into its mobile app. A customer can opt in for retailers to be notified when they are in close proximity to a physical store and receive customized promotions for same-day in-store purchases. A hotel can improve customer service by using these same opt in capabilities to be alerted when premium guests are nearby. This mobile feature can minimize a guest's time waiting in long check-in lines, ensure their room is ready and specific requests are met to enhance their experience with the brand. "The collaboration between IBM and Deutsche Telekom Developer Garden enables us to offer new business models in the area of mobile app development and to unlock new value for our customers," said Rainer Deutschmann, senior vice president, Core Telco Products of Deutsche Telekom. "In addition, the data will be securely hosted on Deutsche Telekom's servers in Germany and thus be subject to the strict German data protection provisions adding a layer of security and assurance to developers and enterprises working in the cloud." Telx has leased an additional 69,000 gross square feet at 60 Hudson Street in New York City, expanding its NYC1 data center in the building by 71%. Telx operates the largest critical interconnection area in the building with greatest density of active cross-connects under management. NYC1 leverages Telx’s dense connectivity environments at both the NYC2 data center (111 8th Ave) and the newly established NYC3 data center (32 Avenues of the Americas) offering the collective Telx customer base access to over 600+ network alternatives. Telx now encompasses 620,000 gross square feet across 6 facilities in the greater NY/NJ metro area. “We have experienced tremendous growth this year in the greater New York/New Jersey metro area. Earlier this year we opened our NJR3 data center on our new highly secure Clifton Datacenter Campus; we followed that momentous event with the recent establishment of our third data center in New York City, NYC3 at 32 Avenue of the Americas; and now we continue our investment in Telx’s backyard with the strategic expansion of our NYC1 facility in the heart of the financial district. The extensive expansion of NYC1 at 60 Hudson Street provides Telx’s clients and prospects with robust connectivity and data center solutions in New York City that is unmatched in the region,” said Chris Downie, CEO of Telx. 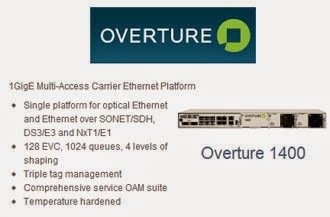 Overture released expansive software updates for Overture 1400 and Ethernet over Copper (EoC) product lines that add significant feature and functionality improvements, extend overall product life, and protect network infrastructure investment. Additionally, the releases enable a new generation of innovation based on the company’s Ensemble Open Service Architecture™ for software-defined services at the Metro Edge. “Across the globe, Carrier Ethernet continues to grow at an aggressive rate and has service providers looking for new ways to maximize the value of their legacy network investments in new architectures. Concurrently, they are embracing nascent cloud technologies to help deliver software defined services at the metro edge,” said Vijay Raman, vice president of product management and marketing, Overture. Alcatel-Lucent will deploy an IP-based mobile backhaul network to support LTE-Advanced services for SK Telecom. The IP/MPLS mobile backhaul solution, which is to be deployed in October, will link SK Telecom cell sites supporting LTE-Advanced, LTE, WiBro (WiMAX), and Wi-Fi mobile data traffic. The backhaul network will also support the carrier's mobile IPTV service. Alcatel-Lucent will deploy its 7750 Service Router (SR)and 5650 Control Plane Assurance Manager along with the Alcatel-Lucent 5620 Service Aware Manager (SAM). Alcatel-Lucent noted it has shipped 300,000 service router platforms (7750 SR) to more than 500 service providers, including KT, LG U+, SK Broadband Korea, as well as globally to customers including AT&T, Verizon, BT and NTT Docomo. 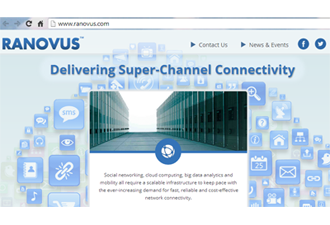 RANOVUS, a start-up based in Ottawa, Ontario, announced $11 million in venture funding for its multi-terabit interconnect solutions for data center and communications networks. RANOVUS’ platform is enabled by the company’s iQuantum Dot Multi-Wavelength Laser technology combined with advanced digital and photonics integrated circuit technologies. The company says its technology delivers significant reduction in power dissipation, size and cost of interconnects, enabling a much higher degree of distortion tolerance compared to traditional solutions. The company has not yet announced any products. Investors include Azure Capital Partners, T-Venture, BDC Venture Capital, OMERS Ventures and MaRS Investment Accelerator Fund. +AT&T and Fon have signed a global Wi-Fi roaming agreement. Customers can use the +AT&T Wi-Fi International App providing access to hundreds of thousands of Fon international hotspots. In turn, Fon network members will gain access to AT&T’s Wi-Fi network, which includes more than 30,000 hotspots at popular restaurants, hotels, bookstores and retailers throughout the United States. The agreement covers smartphones and other Wi-Fi-enabled devices, which will connect seamlessly to select hotspots in both the AT&T and Fon networks. “Our agreement with Fon further expands our international Wi-Fi footprint making it easier for AT&T customers to stay connected to what matters most during their travels abroad,” said JR Wilson, Vice President, Partnerships and Alliances, AT&T Mobility. Fon's telco partners also include Belgacom, BT, DT, KPN, MTC, Netia, Oi, SFR, Softbank and Zon. 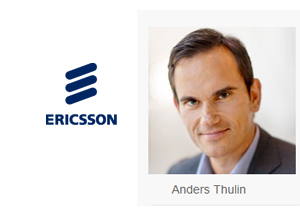 Ericsson announced the appointment of Anders Thulin as Senior Vice President Business Excellence and CIO. He will head the newly formed unit, Group Function Business Excellence & Common Functions. Thulin most recently served as a senior partner at McKinsey & Company. He holds a degree in Economics and Business Administration from Stockholm School of Economics, including MBA studies at the Western University, Ivey Business School.